What Can I Do if I Hurt My Arms While Lifting Weights? Soreness after lifting weights isn't necessarily a cause for concern. A day or two after working out, it's natural to experience delayed-onset muscle soreness (DOMS). DOMS is a consequence of microscopic tears to muscle fibers that occur when you work out. The tears trigger an inflammatory response as the muscle heals. This causes discomfort 24 to 48 hours after the workout. It may be best to visit your doctor if the weight lifting arm pain hasn't gone away within seven days, if it's a sharp pain rather than an overall soreness or if the soreness is only on one side of your body . There are several measures you can take to alleviate arm pain or prevent it from getting worse, such as stretching and warming up, using immediate-relief methods like anti-inflammatory medication and making sure you're eating right and getting enough water. Try not to put too much pressure on your arms if you find yourself with sore muscles post-workout. Doing so could delay recovery. Sore muscles will heal faster if rested, though doing light weightlifting or other low-stress exercise like swimming causes muscle fibers to become more fibrous so they can later endure more strain during harder workouts. 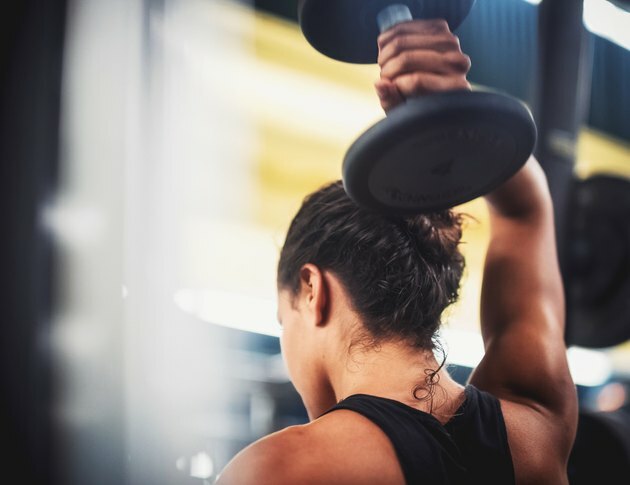 After lifting weights for the first time or for the first time in a while, there will be less muscle tissue damage and soreness, which will lead to a speedier recovery. Athletes often cross-train for this reason — to enhance their muscle strength. Too much soreness could be problematic. For instance, if soreness is keeping you from carrying out your daily activities, then you may want to visit your doctor and refrain from working out until you've healed. When lifting weights, make sure you're using proper form. If you have difficulty maintaining correct form, decrease the weight or amount of repetitions. If you're unsure whether you're doing an exercise correctly, ask a trainer or fitness specialist for help. The best way to alleviate soreness is to slowly build up to a difficult exercise with a lighter version of the exercise. With weightlifting, for example, you can begin with lighter weights and build up to heavier ones to prevent arm strain from lifting. This will help you warm up before your arm workout. It's also important to stretch before and after exercise. Although stretching will not necessarily prevent soreness, it may help prevent a pulled muscle and other weightlifting injuries. It may help to ice the sore area of the body or take a cold bath. Cold baths have been found to reduce muscle soreness and are often recommended to athletes. You can also take anti-inflammatory medication, such as ibuprofen or aspirin, to ease the pain. Later, hours after an intense arm workout, you might want to apply heat to the source of discomfort. Stimulating blood flow with heat could help speed up the recovery process. Though if the area is inflamed, do not apply heat. Massage is another way to quickly relieve sore muscles. If you don't like the idea of someone else applying pressure on the sore parts of your body, you can self-massage with a foam roller or massage stick. Make sure to stay hydrated while you're sore. This will flush the kidneys, preventing protein buildup in the blood. You'll know if you're hydrated if your urine is a light yellow. Just as important is watching your diet. Eating food with protein or carbohydrates, such as potatoes, within an hour of intense exercise hastens muscle recovery. An increase in insulin drives protein to the cells. Chicago Tribune: Can't Move Your Muscles?